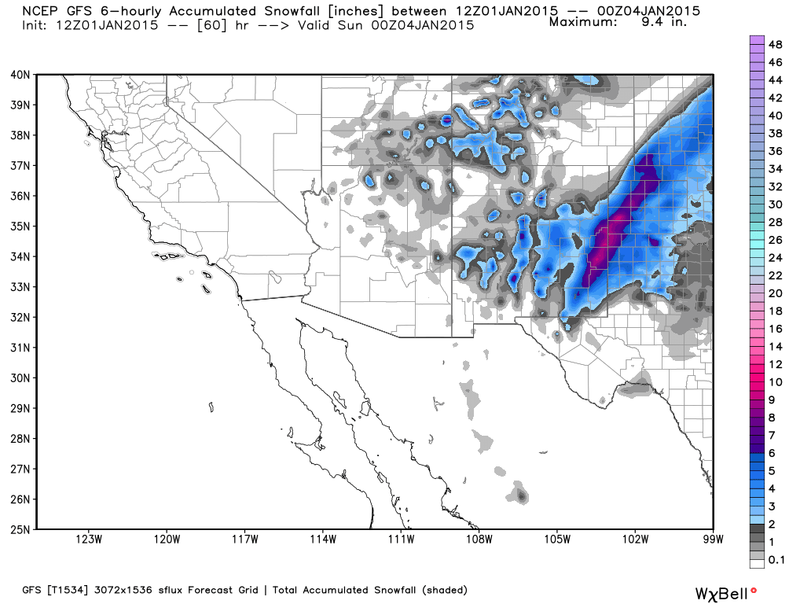 Will SE NM Be The Bulls Eye For Heavy Snows? Icicles In Carlsbad, NM 12-31-2014. 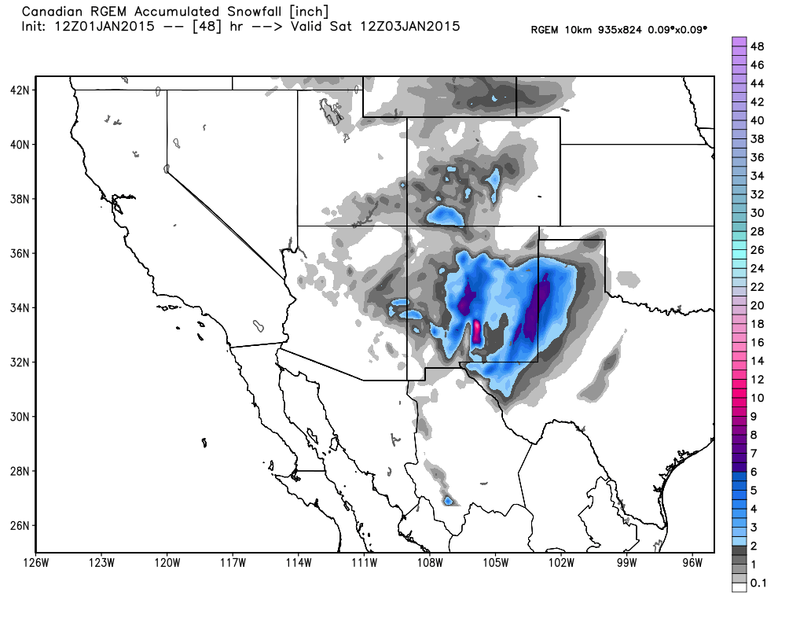 Winter Storm Takes Aim On SE NM. 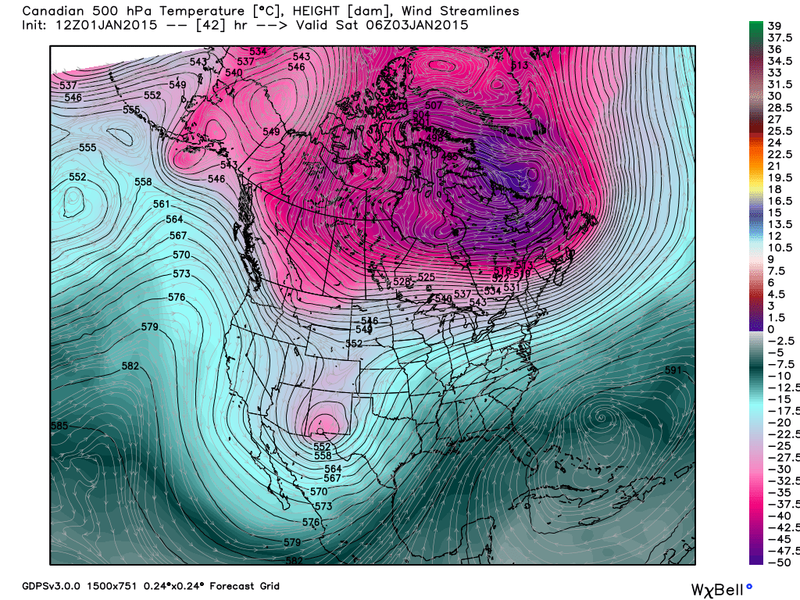 New Experimental GFS (T1534) 500 MB Forecast. 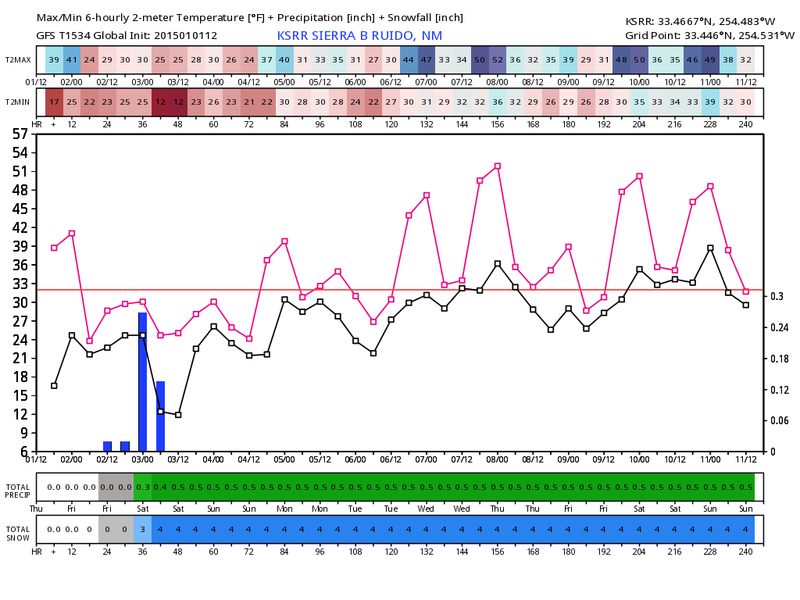 Valid @ 11 PM MST Friday, January 2, 2015. Wow! 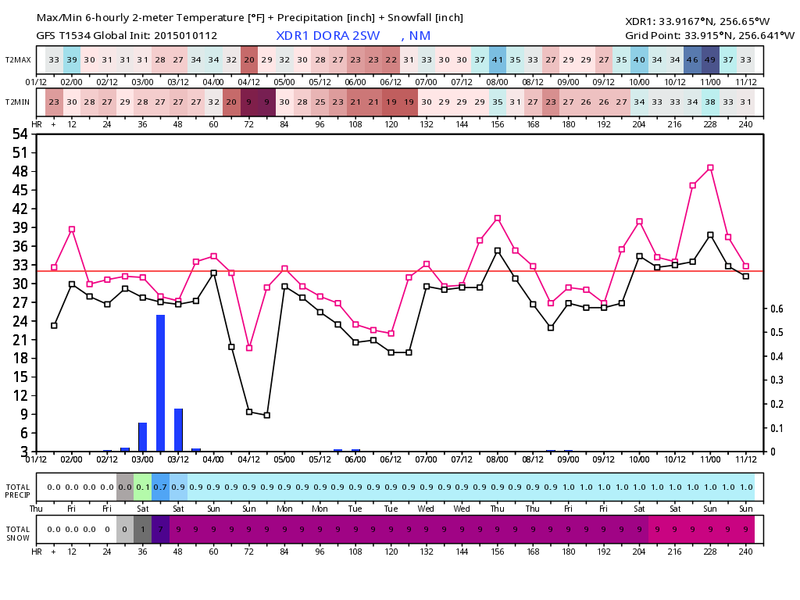 After looking at this mornings Canadian and new GFS (T1534) Experimental forecast models I'm getting really excited. 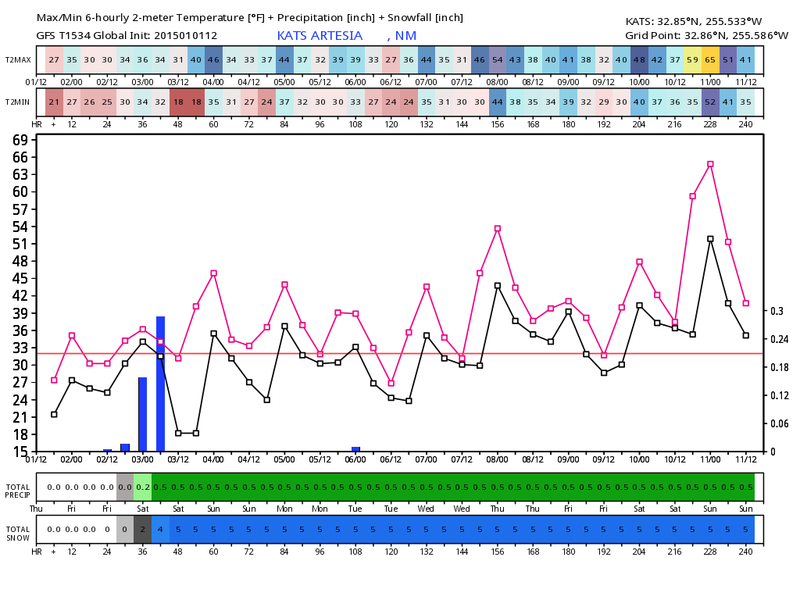 Can you say snow, more snow, and then some? By midnight Friday night the Canadian model brings the center of the 500 millibar closed low just to the west of El Paso, Texas. 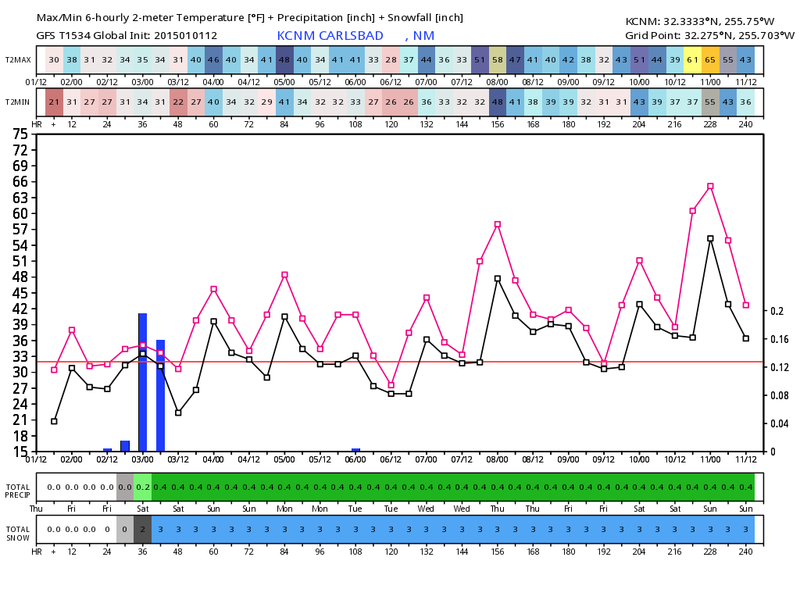 The Experimental GFS model has it a tad bit further near Alamogordo at the same time. Both positions would be ideal for a good snow event across the southern, southeastern, and eastern sections of New Mexico and also across parts of West Texas. So Just How Much Snow Will Fall? 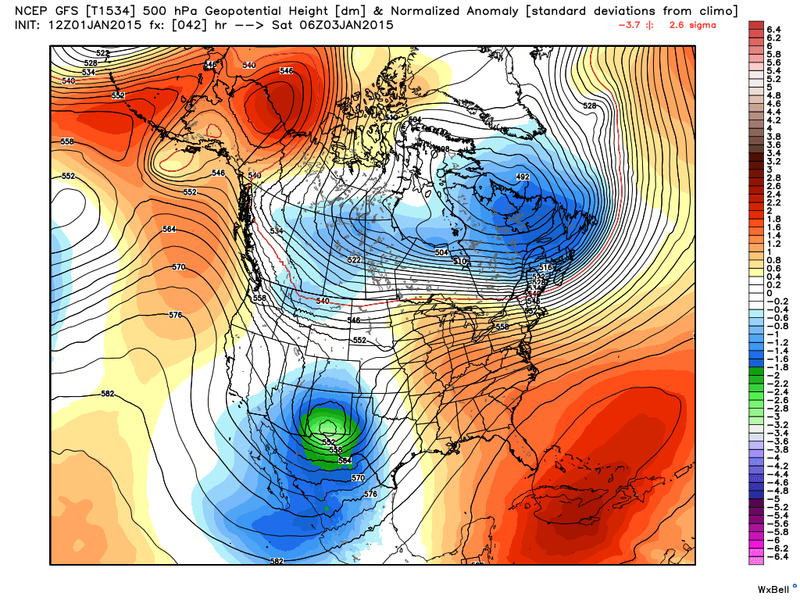 Valid @ 5 PM MST Saturday, January 3, 2015. 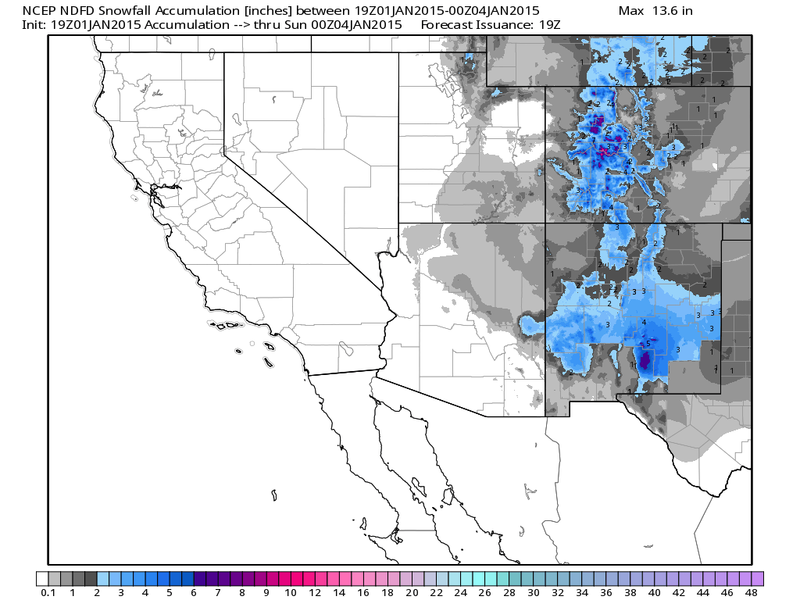 Valid @ 5 AM MST Saturday, January 3, 2015. 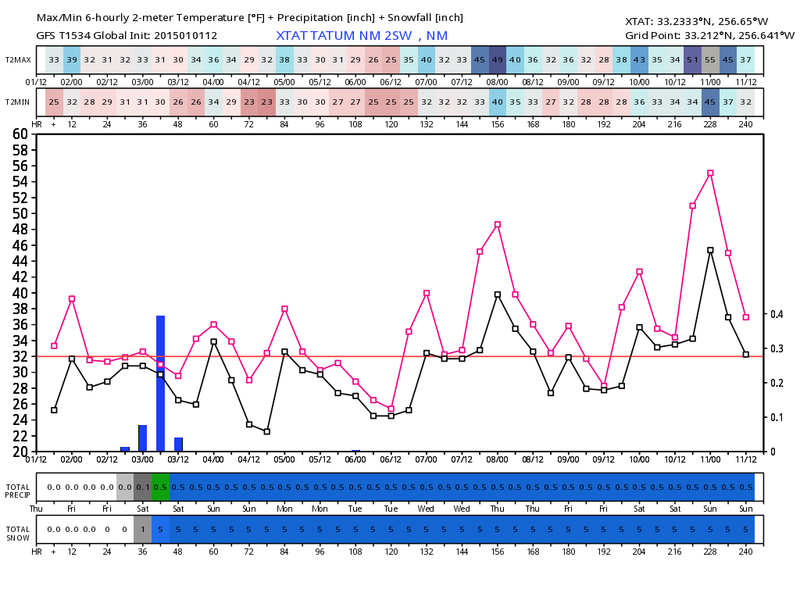 NAM/WRF 3-Hourly Total Accumulated Snowfall Forecast. Time line on the graphic charts above works like this. 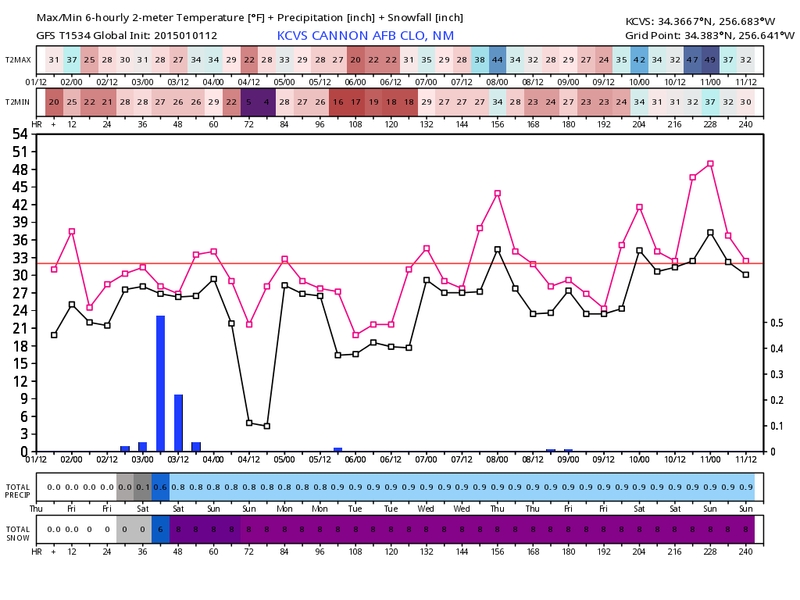 The time grid is broken up into forecasts every six hours. So 01/12 is January 1st at 12Z or GMT, or 5 AM MST. 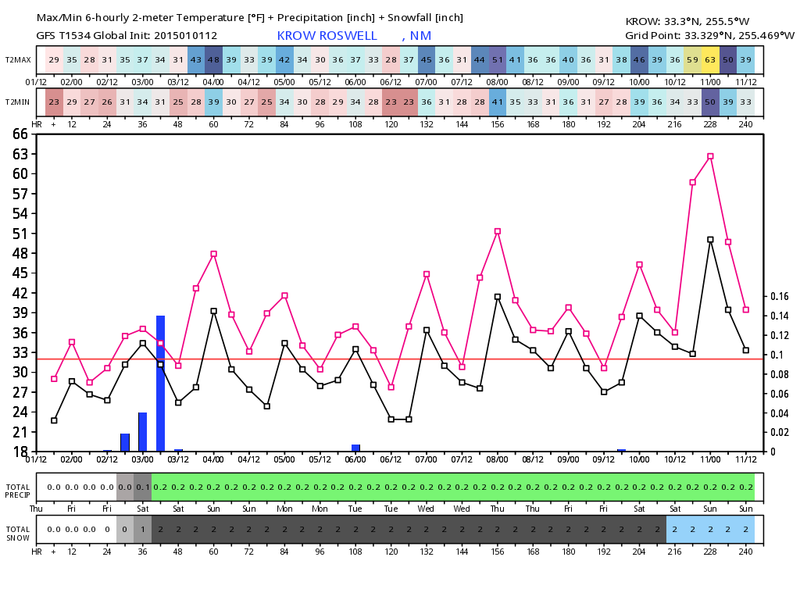 02/00Z is January 2nd at 00Z or GMT, or 5 PM MST. 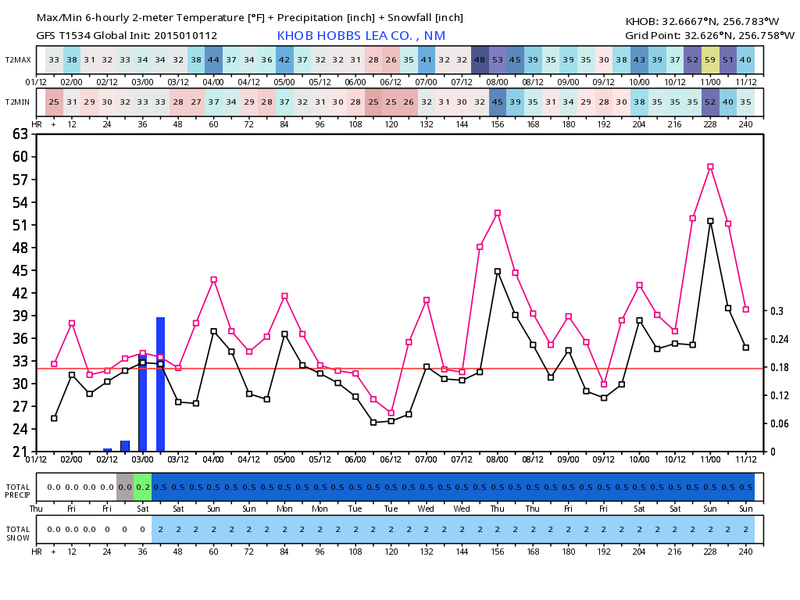 These grids go out 10 days. As always just how much snow falls and where the heaviest snows will fall Friday into Saturday will be dependant upon just exactly where the center of the 500 millibar (roughly the 18,000' level of the atmosphere) crosses. 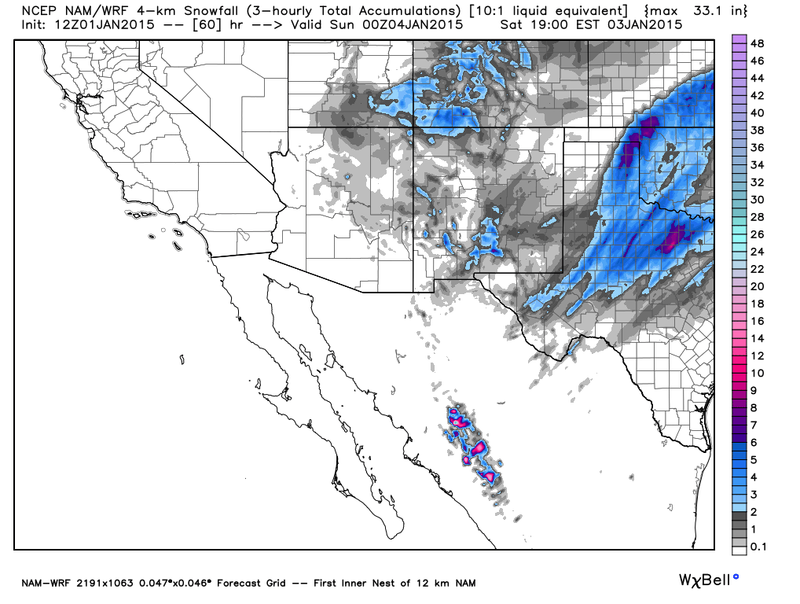 In order for the southeastern plains of New Mexico to receive the brunt of the heaviest of the snows this storm will need to track just a little south of El Paso and Carlsbad before it lifts out to the northeast over West Texas by Saturday night. 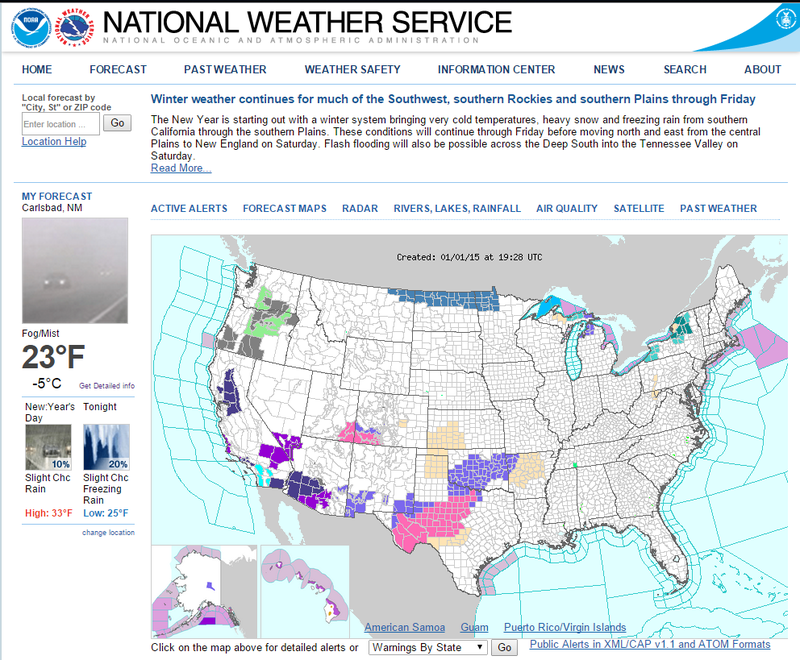 Nothing is set in stone with this storm yet so please keep abreast of all of your latest National Weather Service Forecasts, Watches, Warnings, and Special Weather Statements by clicking on the link provided above. Latest New Mexico Snowfall Reports. Updated @ 11:49 AM MST. • 1 ESE Mentmore - 5.0 in. • 5 WNW Los Alamos - 4.0 in. • Red Hill - 4.0 in. • 6 SSE Luna - 4.0 in. • 2 S Seama - 3.5 in. • 1 ESE Gallup - 3.0 in. • 3 N Fence Lake - 3.0 in. • 9 E Fence Lake - 3.0 in. • 10 N Farmington - 2.6 in. • 5 E El Morro - 2.5 in. • 9 W San Rafael - 2.5 in. • Tse Bonito - 2.2 in. • Red River - 2.0 in. • White Rock - 2.0 in. • Coyote - 2.0 in. • Milan - 2.0 in. • 11 NNW Canon Plaza - 2.0 in. • 1 WNW Red River - 2.0 in. • 1 SW Cedar Hill - 2.0 in. • 2 W Datil - 1.9 in. • 8 NNW Omega - 1.7 in. • 1 NNE Youngsville - 1.7 in. • 6 SW Datil - 1.5 in. • Ramah - 1.5 in. • 8 NNW Gallup - 1.5 in. • Dulce - 1.5 in. • 1 W Grants - 1.0 in. • Laguna Pueblo - 1.0 in. • 2 ENE Natl Radio Astronomy Obs - 1.0 in. • Abiquiu - 1.0 in. • 4 NW Sandia Park - 1.0 in. • 2 NE Bingham - 1.0 in. • 7 NNE Jemez Springs - 1.0 in. • 15 E San Fidel - 1.0 in. • 10 SSE Angel Fire - 0.9 in. • Pleasanton - 0.8 in. • Alma - 0.7 in. • 3 SW Blanco Trading Post - 0.7 in. • 1 ESE Sedillo - 0.6 in. • 8 W Sandia Park - 0.5 in. • Questa - 0.5 in. • Truchas - 0.5 in. • 2 NW Edgewood - 0.5 in. • 1 SSW Milan - 0.5 in. • 1 E Arroyo Seco - 0.5 in. • Socorro - 0.5 in. • Chimayo - 0.5 in. • 2 SE Manzano - 0.5 in. • 8 ENE Albuquerque - 0.5 in. • 9 NE Aztec - 0.5 in. • Farmington - 0.5 in. • 1 ESE Medanales - 0.4 in. • 4 NW Santa Fe - 0.4 in. • Angel Fire - 0.3 in. • 8 ENE Albuquerque - 0.3 in. • 1 SSW Tijeras - 0.3 in. • Rio Communities - 0.3 in. • 3 WNW Santa Fe - 0.3 in. • 7 ESE Albuquerque - 0.3 in. • 4 WSW Rio Rancho - 0.2 in. • 2 SSE Peralta - 0.2 in. • 3 NE Farmington - 0.2 in. • 4 SE Albuquerque - 0.2 in. • 6 NE Rio Rancho - 0.2 in. • 5 W Albuquerque - 0.2 in. • 19 W Bosque Del Apache Refuge - 0.2 in. • 2 SE Albuquerque - 0.2 in. • 5 NE Albuquerque - 0.2 in. • 3 SSW Santa Fe - 0.2 in. • 4 W Albuquerque - 0.1 in. • 5 NW Lamy - 0.1 in. • 9 SE Albuquerque - 0.1 in. • 2 WSW Rio Rancho - 0.1 in. • 2 NNW Albuquerque - 0.1 in. • 2 E Albuquerque - 0.1 in. • 5 E Tijeras - 0.1 in. • 4 NE Albuquerque - 0.1 in. • 1 N Moriarty - 0.1 in. • Eagle Nest - T in. • 11 WNW Cedarvale - T in. Additional New Mexico Snowfall Reports.